Humpty Dumpty Foundation and H-E Parts International Make a Difference to Mackay Base Hospital Donating a Panda Neonatal Resuscitaire unit. 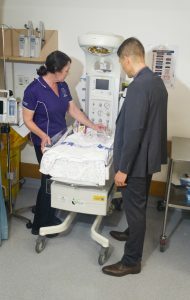 The Humpty Dumpty Foundation and H-E Parts International (H-E Parts), are making a difference to Mackay Base Hospital, Australia, with the donation of a Panda Neonatal Resuscitaire Unit valued at $32,500. The Panda Neonatal Resuscitaire unit is vital for providing infants with a purpose-built examination bed. It includes a warmer and special monitoring device and can be stocked with other equipment to provide oxygen, needed for resuscitation, in treating critically ill babies. This life-saving equipment will be used daily. “H-E Parts’ support of the Humpty Dumpty Foundation and the local community in which they operate is immeasurable. Their support of families across Mackay and the surrounding region means children have access to the latest life-saving medical equipment. 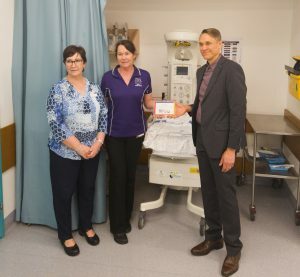 I applaud this contribution to Mackay Base Hospital as it demonstrates H-E Parts International’s commitment to the wider community,” said Paul Francis OAM, Humpty Dumpty Foundation Founder, and Executive Chairman. Kim Van Poelgeest, H-E Parts International, National Contracts & Queensland Operations Manager stated that “this contribution to the Mackay region supports our employees, our customers and their families where they live and work. With three business units in the Mackay area, we have seen a great amount of support from the region over the years and this is our way of ensuring our employees and the greater community have access to vital equipment at the Mackay Base Hospital”. 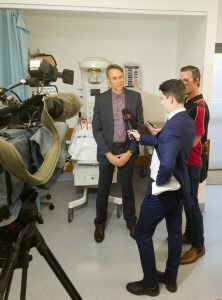 Through annual fundraising initiatives including the Good Egg lunch, Balmoral Burn, City2Surf and the Great Humpty Ball along with the support of generous individual and corporate donors, in 2017 the Humpty Dumpty Foundation delivered around 500 pieces of medical equipment to hospitals across Australia. One of the Humpty Dumpty Foundation’s breakthrough fundraising methods was the creation of ‘Humpty’s Wish List’ in 2001. Each piece of essential medical equipment that appears on the regularly updated Wish List has been requested specifically by the hospital to meet an immediate need. The medical equipment requested is stringently assessed by the Humpty Dumpty Foundation’s medical sub-committee made up of senior medical administrators and clinical specialists, before it is added to ‘Humpty’s Wish List’. To date, 383 hospitals across the nation have benefited from the life-saving medical equipment, specifically to care for children and babies, provided by the Humpty Dumpty Foundation and it’s amazing “Good Egg” supporters.